When you check-in, please ask 'Is the landlady here?' I love to come out and greet my customers. 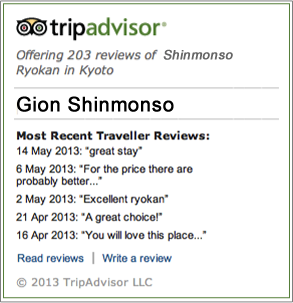 Gion Shinmonso was founded by my great grandfather and it has now been 64 years (2013 present). Until I was 9 year old, I lived on the 4th floor of this Ryokan. I was never obliged to take after my parents to be a landlady, but after graduating university I decided to work here. When I was a student, I studied accounting and my dream was to work in that field. I started working at my parents' office and was optimistically hoping to be able to steadily do what I wanted. 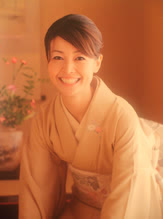 The landlady is inevitable in the culture of Japanese Ryokan. Japanese Ryokan differs and each have their own style all depending on the landlady. Some landladies do not come out in front of customers from being occupied by managing, some landladies wear the same uniform that the employees wear, some landladies dress in their kimono and come out to the open to greet their customers, and some landladies do not come out at all because they work by educating their employees. However, throughout all of this work, our fundamental goal is to help our customers at Gion Shinmonso to have a memorial and a fabulous time in Kyoto!! Our business does not wish for only profit, like wanting repeater customers. We are the center and the representative of Japan, having 1200 years of history, so we feel blessed. Kyoto is a city with traditional culture and our wish is to be able to share that beauty with the tourists – including Japanese and foreign tourists. Gion Shinmonso only has 21 rooms, 4 people at the front desk, 5 cooks, and 10 room clerks which adds up to just 30 employees. However, because we are a small Japanese Ryokan, I know that my thoughts will be expressed to the customers through my close employees. Some of the employees have been working here since I was a child and are still greeting customers just like they did 30 years ago. In Japanese Ryokans, you can feel the warmth of the people and experience that, at home feeling, which is very different to hotels. And depending on the each Ryokan that warmth is different according to the owner. You have come a long way to Japan. And then to Kyoto. I wish for you to soak up the people of Kyoto and the culture of Japan. And don't forget, when you check in, please ask for me. I might look tired from desk work, but I will happily come out and greet you. I might not be able to speak English very well or I might not be in my kimono outfit, but whatever the situation, as a memory I would love to take a picture with you!